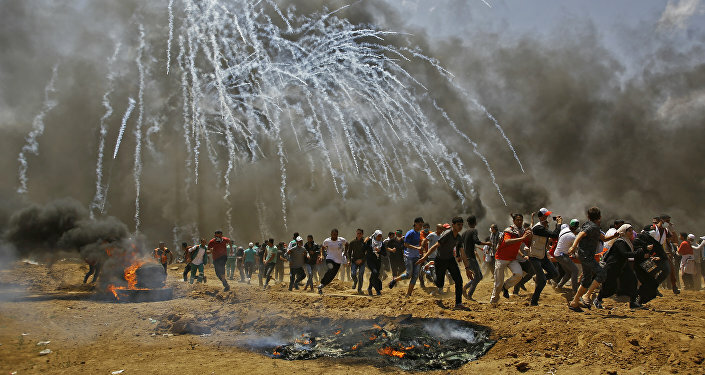 WASHINGTON (Sputnik) - The terrorist group Hamas is responsible for the deaths of dozens of civilians during protests in Gaza earlier today, White House spokesperson Raj Shah said in a press briefing. "We’re aware of reports of continued violence in Gaza today. The responsibility for these tragic deaths rests squarely with Hamas," Shah told reporters. Shah said that Hamas is "intentionally and cynically" provoking a response, adding that "Israel has the right to defend itself" as it has been previously noted by US Secretary of State Mike Pompeo. The US plan for peace in the Middle East will not be affected by either the opening of the new US Embassy in Jerusalem or the deadly protests taking place in Gaza, White House spokesperson Raj Shah said. "The actions today, both the opening of the embassy in Jerusalem and these tragedies in southern Israel, we don’t think will impact the peace plan," Shah told reporters. Shah noted that the United States would release its plan for peace between the Israelis and Palestinians at the appropriate time, adding that the plan should be judged on its merits. According to the latest information from the Palestinian Health Ministry, at least 52 Palestinians were killed and over 1,200 wounded by Israeli fire. Israeli army stated that there were 12 clashing points along the fence, with Karni and Rafiah crossings being the largest two. More than 10 thousand Palestinians have reportedly participated in protests in the Gaza Strip against the opening of the US Embassy in Jerusalem. Since March 30, Palestinians have been holding mass rallies, known as the Great March of Return, near the Gaza Strip border.